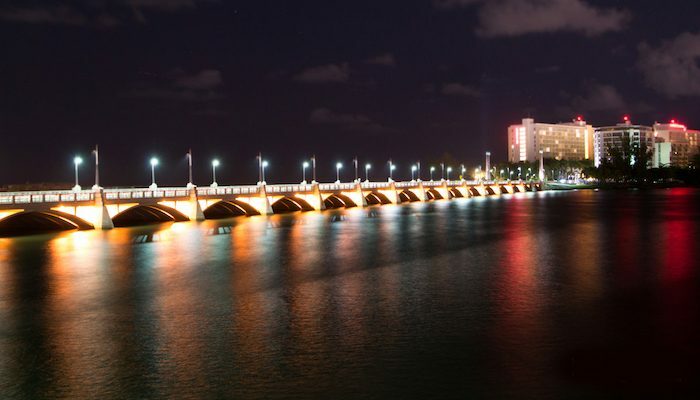 The area around the Condado Peninsula, where popular Ashford Avenue connects Old San Juan with the remainder of the city via a gorgeous bridge, is a treat for running, with several good options. An easy out and back is to take Ashford Avenue from La Ventana al Mar Park to Fortín San Gerónimo de Boquerón. This is a 2.3 mile out and back, with great waterfront views on three sides and a generous sidewalk. 5 mile loop option: One can also do a terrific loop. From the Fortín Boquerón, continue around Point Escambrón and Beach past the Caribe Hilton, around Parque del Tercer Milenio and through Luis Muñoz Rivera Park. Then cross back over the Guillermo Estéves Bridge, and run on the south side path of the lagoon, with great water views, back to the starting point. The last 0.5 miles is along slightly busier roads.